In forex, different trade orders are used to initiate trade positions. The thinking behind the use of different order types in forex is to enable the trader to take advantage of various market situations in order to get the best possible market deals. The names allocated to each trade order type as well as the procedure for placing such orders different from one trading platform type to another. For instance, the name of a particular forex order on the MT4 will not be the same as the same order when used on the ActFX turnkey platform. Of all trading platform types available in the market, the order placement nomenclature and procedure for the MT4 is the simplest and easiest to use and understand. For this tutorial on order types, we will use the system of the MT4 to define order types and explain the meanings of these orders. Where possible, analogies to similar order types on other forex trading platforms will be made. Each type can be further subdivided into buy or sell for market orders, and limit or stop orders for pending orders. Limit and stop orders also have buy and sell subdivisions. A market execution order is an instruction from the trader to the broker to execute a buy or sell order for a currency at the prevailing market price. A market order is therefore an instant order, as the trader is interested in having the order fulfilled instantly and not at a later time or date. The snapshot above shows the various orders that constitute the market execution orders. The Buy (by market) order on the MT4 platform is an instruction by the trader to the broker to buy a currency pair at the prevailing market price. It is used when the trader has an expectation that prices will start to rise immediately. The Sell (by market) order on the MT4 platform is an instruction by the trader to the broker to sell a currency pair (or go short) at the prevailing market price. It is used when the trader has an expectation that prices will start to fall immediately. The emphasis is on the word “immediately”. The market execution orders are used when the trader wants to get in on the action as delayed trade entry will lead to a shortfall in the profit the trader expects from the trade. Some reading the article may be surprised as to why the stop loss, take profit and trailing stop have been added as market execution orders. These in themselves are also trade orders. The Stop Loss order is an instruction from the trader to the broker to automatically end an active trade at a certain unfavourable price that has imparted a negative value to the position in order to avoid further losses. The broker does not just close the order. A stop loss is only fulfilled by selling off the position to a counterparty (for a buy trade), or buying off the position in a sell trade. Usually the broker has to look for, and match buyers or sellers who want to deal at the price set as the stop loss to execute that order. That is why the stop loss is also known as a stop order in other trading platforms. The Take Profit (TP) instructs the dealer/broker to match the trader’s order to exit the position at a certain favourable price to another party prepared to acquire the position at that price. Therefore, the TP requires that the broker matches the order to exit the trade at a particular favourable price to another trading party prepared to acquire the position at that price. The Trailing Stop is simply an order to the broker to adjust the stop loss for a trade to follow advancing favourable prices by a particular number of pips, and to close the position when the price has retreated against the trader’s position by a certain number of pips. A pending order is an instruction from the trader to the broker to execute a buy or sell order for a currency at a future time/date. A pending order is therefore a delayed order. They are used when conditions in the market do not favour an immediate entry. Pending orders can be limit orders or stop orders. Limit orders are used when the trader feels that prices will be unfavourable to his expected trade direction before they become favourable. 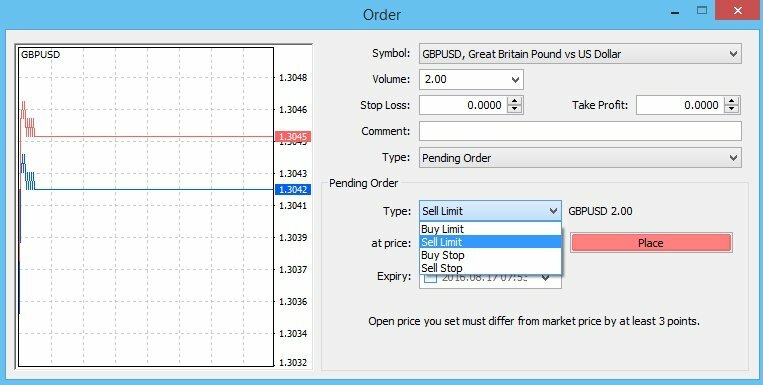 Limit orders have a buy and sell component (Buy Limit and Sell Limit). A Buy Limit is used when the trader feels that the price of the asset will fall initially before they start to rise again. Obviously if prices will fall before they rise, a market buy order cannot be used as this will cause immediate negative value to the position. There is no way of knowing before initiating a trade how negative a position can become before recovery. Therefore a Buy Limit is setup by using an entry price which is lower than the market price. You can open the “New Order” window by pressing F9, right-clicking on the chart or clicking the New Order tab. In the pop-up window which opens, select “Pending Order” as order type, and “Buy Limit” as subtype. Enter the price at which you want the trade to be executed. This should be at a level lower than the market price. Set your Stop Loss and Take Profit levels and click “Place”. A Sell Limit is used when the trader feels that the asset price will first be unfavourable (i.e. will rise in this case) before it falls. Obviously if prices will rise before they fall, a market sell order will cause the position to have an immediate negative value. To avoid this, a Sell Limit is used. In the pop-up window which opens, select “Pending Order” as order type, and “Sell Limit” as subtype. Enter the price at which you want the trade to be executed. This should be at a level higher than the market price. A Buy Stop is a trade order which sets the entry price of the trade at a level that is higher than the market price. The expectation is that a strong bullish run that is expected to break a resistance will continue. In the pop-up window which opens, select “Pending Order” as order type, and “Buy Stop” as subtype. Set your Stop Loss and Take Profit levels and click Place. A Sell Stop is a trade order which sets the entry price of the trade at a level that is lower than the market price, with an expectation of a strong bearish run that is likely to take out an established support and establish new lows. In the pop-up window which opens, select “Pending Order” as order type, and “Sell Stop” as subtype. Pending orders also come with the option of setting a time and date when the orders cease to be valid and can be cancelled from the system.